Recently, the Virginia Junior Academy of Science (VJAS) Research Symposium took place at Virginia Commonwealth University. 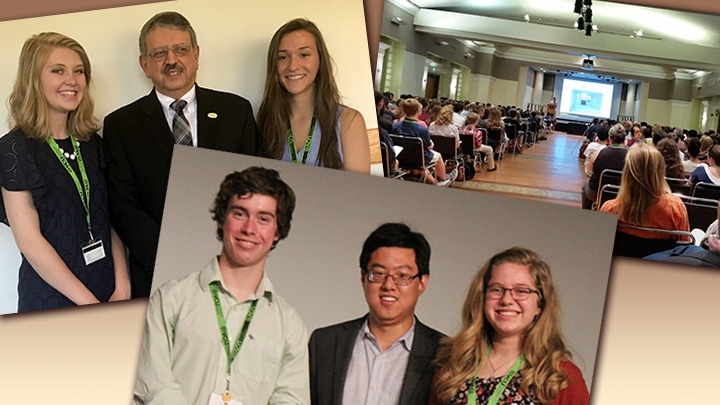 For three days, eight hundred of Virginia's middle and high school students with a passion for science came together to share their research with their peers and to be judged by experts. The Virginia Junior Academy of Science, one of the Nation’s foremost junior academies, was created 76 years ago by the Virginia Academy of Science (VAS). "Since 1923, VAS has been supporting scientific research, seeking to improve science education, and encouraging fellowship among scientists, students, and citizen scientists throughout the state. VAS and VJAS combined reach 40,000 secondary students each year and award over $80,000 in scholarships, prizes, research support grants, trips to national meetings and events annually, "explained Deborah Neely-Fisher, VAS President. Students in grades 7-12 conduct research in sixteen areas of science including Microbiology and Cell Biology, Medicine and Health, Chemistry, Physics, Engineering and Math, Environmental Science, and Human Behavior to name only a few of the categories covered. "This is a gathering of the best scientific minds from across the Commonwealth," shared Se W. Jeong, Chairman of the VJAS Committee who works tirelessly to make this symposium happen for our students. "Each student conducted a high caliber research project to participate, with some students having worked on their topic for two years. They write a formal paper which is screened by scientists and researches from across the state. Once they are accepted, the students come to the symposium in May to share their oral presentations which are judged by experts in their field." Students also get to experience the college environment of dorms, food, lab and classroom spaces as VJAS rotates between different Virginia Universities each year. For this symposium, the oral component consisted of a 10 minute creative power point presentation followed by 5 minutes of Q & A. What better way to prepare young scientists to be better science communicators. Jeong explained their approach as "working with our young scientists to not only help them communicate scientific research to scientists, but also to communicate their research in a way that the general public will care. This skill is very important because funding for research comes from the public. Our teachers are excellent educators and role models and help shape their communication to reach a general audience." Titles of the presentations ranged from humorous (one great way to reach a general audience!) such as "Barnacles, Crabs and the Zombie Apocalypse: A Study of the Invasions of Lozothylacus Panopei in the Lower Chesapeake Bay" or "Innovation in Backpack Safety: Can Gummy Bears Save Lives?" How about reaching for the stars with "C-type Asteroids as a shield against ionizing radiation during spaceflight" or to solving a medical problem such as "Determining the mechanisms by which PLK1 regulates prostate cancer progression." The topics chosen for the research projects represented great depth and understanding of diverse scientific hypothesis and universal problems that need to be solved. Susan Booth, Director of VJAS explained that "all students are welcome to be part of the Virginia Junior Academy by becoming a member. Participation is not just doing a research project, but attending a symposium to see what other young scientists are working on and to begin to network. Students come from all walks of life -public schools, independent schools, home schools, mentorships, field studies or classroom scientists. All are impacted by the Scientific Investigation of Learning (SOL) so why not show off their research!" Jeong shared, "This year we are reminded once again of the crucial role of scientific and technological advancements in creating a better world. We are expanding our knowledge in every field; pushing the boundaries of research and discovery to a new level each day. This is where we need all of our young, talented, next generation scientists, engineers, and researchers. Our job is to re-double our efforts to foster curiosity and generate innovative thinking in our young scientists to solve the ever-growing list of challenges we face today. Remember, scientific progress does not happen overnight. Only systemic, continuous investment in current and future research and education will yield significant growth and benefit to society." And to see how these young scientists mix research with fun, here is a video produced by participants.